Bluerank the best in Europe! Bluerank triumphs again. It is the only Polish agency that received the Oscar of Internet industry - European Search Awards statuette. This time a content marketing campaign carried out for Leroy Merlin has proven to be best. The award was collected by Maciej Gałecki, Bluerank CEO, during the ceremony in Paris. We beat a very tough competition! The jury evaluated the campaigns in many aspects, in this edition of the awards the campaign for Leroy Merlin was nominated in two categories, one nomination has turned into the award and that great distinction makes us even more happy. That is another proof that our campaigns are realized at the highest level - says Maciej Gałecki, Bluerank CEO. European Search Awards is an international competition organized since 2012. The jury is composed of the world’s SEM experts who annually awards the best campaigns in the field of SEO, PPC, Content and Digital Marketing. This year, Bluerank has won a record number of 6 nominations. Eventually, the campaign for Leroy Merlin, nominated twice in this edition, won the award. 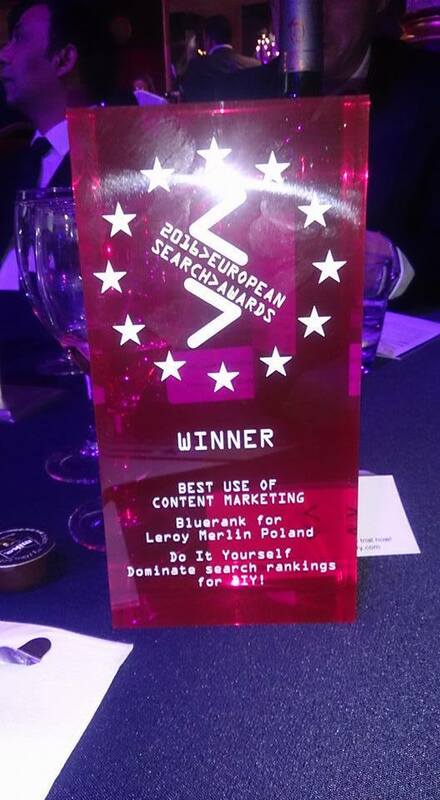 It proved to be the best campaign in "Best Use Of Content Marketing" category. Bluerank has been cooperating with Leroy Merlin since 2014. A long-term strategy developed together includes improvement of visibility in natural search results, SEO, PR and content marketing activities and the use of advanced web analytics to track and evaluate behavior of website users. We are very proud, it is a great achievement. From the very beginning the campaign has been carrying out at the highest level, has brought outstanding results and the award is confirmation of that - says Przemek Porada, Internet Manager at Leroy Merlin. It is the second award for Bluerank in company’s history. First statuette of European Search Awards was won by the agency in 2014. That was when the campaign for Mitsubishi Motors was recognized as the best one in "Best Local Campaign" category.